General Electric’s (NASDAQ: GE) struggles continued during the third quarter, as its earnings missed consensus estimates. The company’s revenue came in at $29.6 billion (down 3.6% y-o-y), while adjusted earnings came in at 14 cents (vs. 21 cents in Q3’17). GE’s shares have slumped nearly 67% from $31 in early 2017 to a low of $10 at the end of October. The lower than expected results were largely due to a disappointing performance from the Power division. The segment’s revenue dropped 33% year-on-year, causing the segment to report a loss. Aviation and Renewables were top performers for the company in Q3, with revenues growing 12% and 15% year-on-year, respectively. GE also announced its intention to split the Power division into two units in order to improve its cost structure and drive better outcomes. GE’s recent dividend cut, the Power segment struggles, restructuring, and SEC investigation continue to put pressure on the stock. The company’s turnaround could take some time, and will likely depend on an improving business environment, global growth, and a turnaround of the Power division. Accordingly, we expect GE to report mixed results over the next few quarters. Below we provide a brief overview of the company’s results and what lies ahead. Based on the recent results and market trends, we have revised our forecasts for General Electric for the full year. We have updated our model, cutting our price estimate for GE to $15 – which is still significantly higher than the market price – based on the expected performance of the industry. Our interactive dashboard analysis on General Electric’s Performance In Q3 And Expectations For 2018 details our expectations for the company. You can modify the different driver assumptions, and gauge their impact on its earnings and valuation. GE’s Aviation segment contributes nearly 25% of the company’s overall revenue, and saw its revenue grow by just under 12% to $7.5 billion in Q3 2018. The segment continued its robust momentum from the first half of 2018 into Q3, as a result of higher equipment orders – driven by increased demand for LEAP engines, and strong service orders, partially offset by lower military volume. Further, the segment’s margins improved by nearly 240 basis points to 22.3% largely due to improved pricing and cost efficiency. GE’s wins at the Farnborough international airshow should complement the segment’s continued tailwinds and help boost segment revenue to nearly $28.4 billion (+6% y-o-y) along with strong growth in the Military business, air freight volumes, and the delivery of about 1200 LEAP engines by 2018 end. The Renewable segment contributes under 10% of the company’s overall revenue and was the fastest-growing segment in Q3. The segment has seen its revenue grow by nearly 15% to $2.9 billion, as a result of improved demand for onshore wind turbine orders, partially offset by onshore wind repower volume. The pricing pressure and lower repower volume significantly compressed its margins, as they fell by about 660 basis points to 2.1%. The Renewable Energy segment holds solid growth potential for GE, as a result of the increasing domestic and international wind and hydro orders. We expect the segment’s tailwinds to provide decent medium-term growth opportunities driven by strong growth in the domestic and international onshore wind and hydro orders, and offshore wind orders. Further, we expect the acquisition of LM Wind Power should provide reasonable growth opportunities. Additionally, we expect the robust outlook of the repower market to provide for decent growth opportunities. 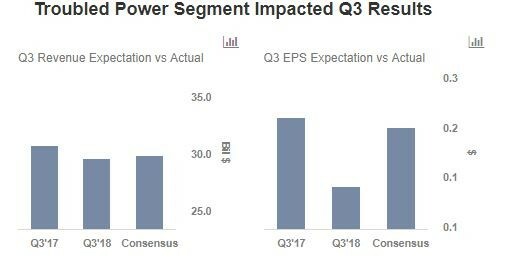 The Power segment contributes nearly 29% of the company’s overall revenue, and has seen its revenue fall by 33% to $5.7 billion in Q3. The subpar Q3 was largely due to broad based weakness in Gas Power Systems – fewer than expected equipment orders, coupled with lower market penetration and growth of renewable energy. A key takeaway from Q3 was GE’s proposed plan to reorganize its Power division into two separate businesses, in a bid to enhance the efficiency of its cost structure. Further, GE expects another tough quarter for the segment as a result of a challenging power market – mainly due to the high-end gas turbine market being fairly weak. We expect the 2018 revenue in this segment to decline by nearly 13% to $30.4 billion, driven by ongoing pricing pressure and lower than expected equipment orders.